Duplicitous is a word with an appropriately tricky origin. It was originally a legal term for including two pleas in one, which is a no-no. Much like that origin, many terms for the Iago-like and Loki-ish have been lost in the mists of time (or maybe stolen by some rat-brained, two-hearted turncoat). Consider reviving these words the next time you encounter anyone twistical. This term is usually literal, describing trains, snakes, and monsters with two noggins. But it’s sometimes been part of the lexicon of duplicity, much like double-hearted. This word for describing anything duplicitous stems from the many sketchy meanings of gammon. Gammon and patter is criminal cant or slang. Gammon and spinach is horsefeathers. Various other meanings involve tricking, wheedling, or seducing someone, so if someone’s being twistical, they’re gammonacious. Many meanings of twifold simply refer to things that are two-pronged but basically innocent. Other senses refer to double-dealing diabolical denizens of Deceit-ville. Since the 1300s, double all on its own has had more than a numerical meaning, conveying two-facedness and base treachery. In 1715, Gilbert Burnet’s History of My Own Time described a dude who was “very double, or very inconstant.” In 1866’s Felix Holt, the Radical, George Elliot wrote about a tricky situation: “To act with doubleness towards a man whose own conduct was double.” This kind of meaning informs double agent. 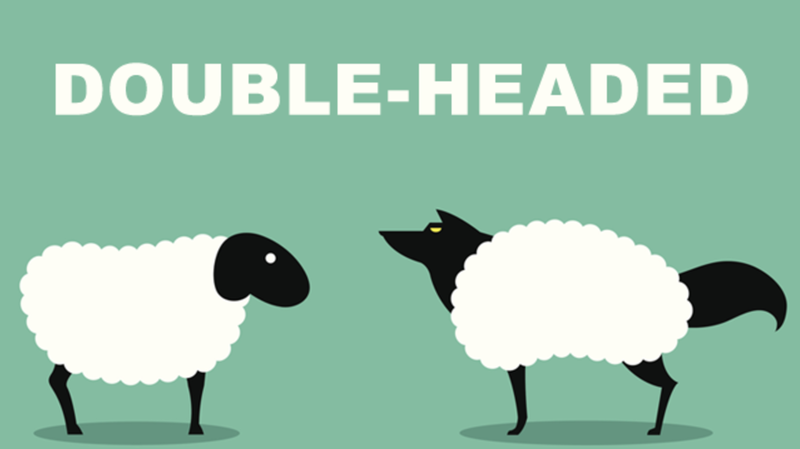 With roots in Old German and Old Norse, this is one of the least familiar words for the ever-familiar topic of duplicity. You don’t hear about swikel words, deeds, and creeps anymore, which is too bad. There was a real ring to variations such as swikelness and swikeldom.